It’s day six of the RAGBRAI bike ride across Iowa. I stop at the tiny town of Castalia to wait for the rest of the team. In 2016, the population of Castalia was 106, but there is a church on the main road through this village. Day six is when the going gets tough. We know that the really big hills are yet to come and wonder if we will have enough energy to make it to the top. At the same time, our minds begin to think beyond RAGBRAI to the end of the race and all that faces us when we get home. All of a sudden, I hear music. A live group is singing in the church parking lot. Now let us have a little talk with Jesus, and let us tell him all about our troubles. He will hear our faintest cry, and he will answer by and by. And you find a little talk with Jesus makes it right. As I listen, I think about all that I have learned from my first RAGBRAI experience. Our Circuit Rider Team consisted of five riders of varying ages, experience, abilities, equipment, and pace. We were all riding to the same destination, but how and when we got there was determined by each one of us individually. At times, the faster riders would wait by the side of the road for the others to catch up, but we always regrouped at the formal stops to eat, rest, share stories, and enjoy the entertainment. We learned to ride our own unique ride toward our common goal and encourage each other on the journey. In the same way, each United Methodist church is unique. In order to fully engage their communities, congregations must seek out the needs of their constituents, discover their own strengths and then develop ministries that make a difference by sharing God’s love with all. I had a marvelous time getting to know churches and clergy all the way across the state. 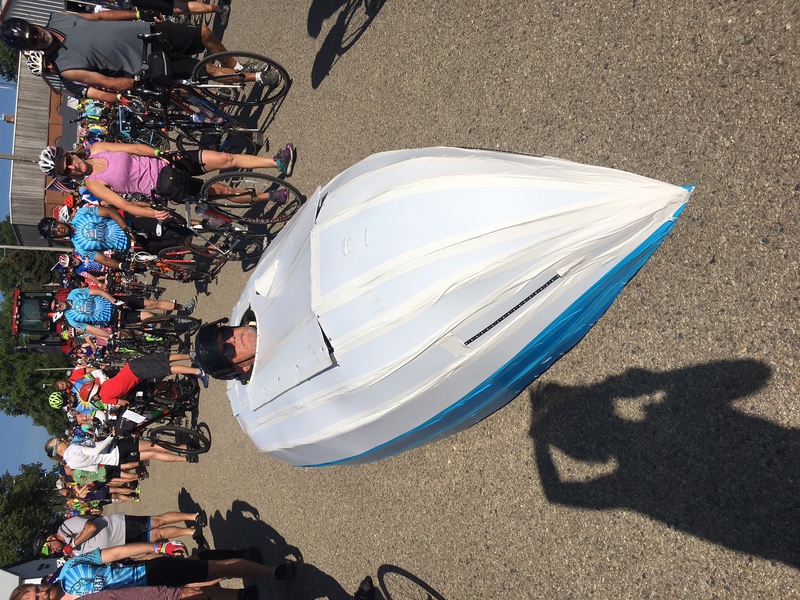 Every church along the RAGBRAI route found some way to welcome and engage the riders, using their own location and special gifts to make a difference. One church had at least a dozen signs beginning ten miles before the stop, advertising “church lady pies.” It worked! By the time we arrived at the town, we couldn’t wait to dig into a piece of pie! But Jesus is a friend who watches day and night. And just a little talk with my Jesus gonna make it right. 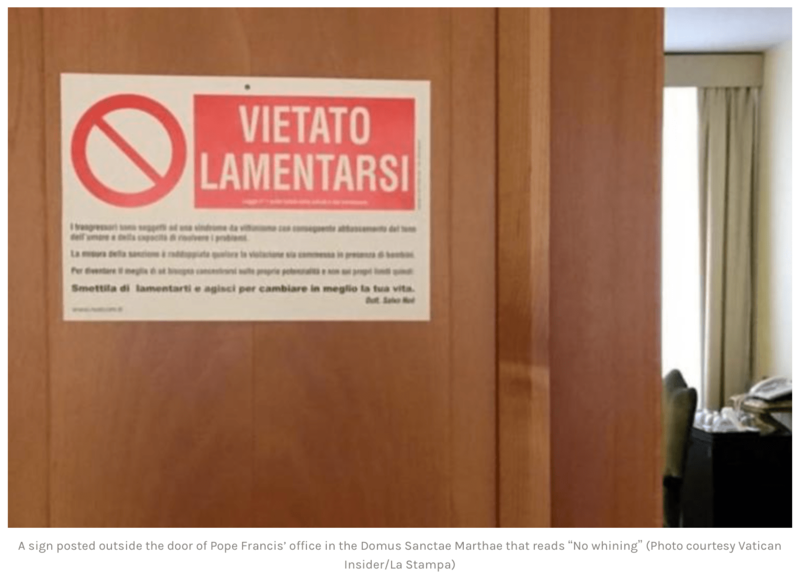 “No whining!” was the headline of a sign that was posted on Pope Francis’ office door last month. The sign was given to the Pope by Dr. Salvo Noe, a psychologist and motivational speaker. The sign says in Italian, “Violators are subject to a syndrome of always feeling like a victim and the consequent reduction of your sense of humor and capacity to solve problems…Stop complaining and take steps to improve your life.” Pope Francis, who undoubtedly has to deal with many whiners and complainers, as do all leaders, was said to have laughed heartily. RAGBRAI riders have many reasons to complain during the course of the week. It’s not easy to ride with 10,000 people, often in close proximity. Our lips are blistered from the sun, our bottom is sore, and we can’t drink enough to stay hydrated. Maybe the loud music of the partying at night has kept us awake. We ride for an hour in a severe downpour and are feeling chilled, or else we are pedaling into a fierce wind, getting nowhere fast. We’ve waited in line at the United Methodist church for their sloppy joe and macaroni and cheese dinner, and when we finally get to the front, we discover they have run out of food. This past April, Pope Francis met with clergy and said that complaining “dashes hope.” I pray that when I am tempted to whine or complain, I will have a little talk with Jesus, who will make me whole. And then a little light from heaven fill my soul. Learning #3: You can do good wherever you are. Twenty-one years ago, in 1996, a small group of RAGBRAI riders who were concerned about at-risk youth in the Des Moines area met to discuss how these youth could experience the benefits of training for and participating in RAGBRAI. The first Dream Team rode in the 1997 RAGBRAI, and since then 20-30 youth have participated each year. Youth are recruited through the Des Moines school system, church groups, after school programs, and the court advocate system. They receive all the necessary riding equipment for free and start training with adult mentors in February. Those who go on to complete RAGBRAI come away with the skills to set goals, work as a team, and maintain a healthy lifestyle. And you find a little ride with Jesus makes it right. did you find the energy at the end of the day?) and sharing this tour with us. Bishop Laurie, I really enjoyed your trip on RAGBRAI, and your comments – what energy you have! I’m an old retired Assoc. pastor, and you really gave me an insight of what the “ride” is all about – thanks for sharing it with all of us. Wow! So glad to know you and so delighted to have read the stories of this big bike ride. Congratulations to you and all the others who are completing a huge project!! Thanks, Laurie, for your daily RAGBRAI posts. I’ve been with you each day in prayer and spirit as you, your teammates, and all participants have ridden across Iowa. Thanks for sharing this wonderful experience! Kudos to you and the team for sticking to it! thankful that you have continued with your blog. when I was in elementary school. I anticipate Mondays. Good wishes to you and Pastor Gary.